Belvoir presents THE DIARY OF A MADMAN by Nikolai Gogol adapted by David Holman with Neil Armfield & Geoffrey Rush in the Upstairs Theatre. My friends and I had organised ourselves and waited for five hours to hopefully get tickets to see this show. We were able to buy our tickets but not until ten minutes before curtain. We became increasingly anxious and excited as the clock ticked forward. Then we were called to the ticket office. It had been a very pleasant afternoon in the Belvoir foyer waiting and chatting to perfect strangers who were similarly patient and expectant, and whether we got in or not, the day had not been wasted. Just before the lights out, two young men struggled across our legs to the seats next to us and leant eagerly forward towards the stage as the stage lights went down. In the interval, impressed by their attentiveness and the fact that they like us had sought out their tickets in the same way, I asked what they were doing there. It was a glorious Sydney summer day / night and it was school holidays. They told us that they were studying theatre criticism as part of their High School curricula and had selected this work to complete some study and to see Geoffrey Rush. Again impressed, I asked what school did they attend. They replied: Newington. I asked if they had been part of the audience from Newington that had attended BANG, my favourite show last year, Downstairs. It turned out that we had all been there together, on the same night. Is this school doing something right? I pondered, hopefully. "What a coincidence!" I remarked. At the end of the performance I asked how had they experienced it. They were almost speechless in amazement. 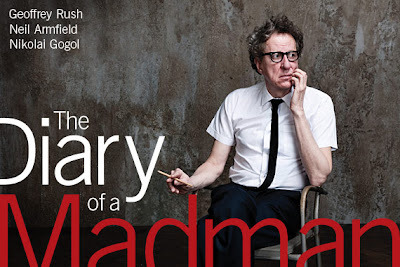 I, from the great dottage of my world weary experience of a life time of theatre going, said to them, that in the time to come they would be able to tell their children that they can remember when they had seen Geoffrey Rush In THE DIARY OF A MADMAN as a benchmark of witnessed great artistry. It would be rare for them to see an artist, so beautifully, giving a performance of such flawless skill, humour and passion. Just plain old-fashioned passion for performing for a live audience. The personal sacrifice of a great artist, burning himself up both psychologically, and especially, physically, to tell the truths of Gogol's Madman, Aksentii Poprishchin, just for us that night in the Belvoir Theatre space.. I have mused to myself, it is like the recorded memory some others have written about and I have jealously read, of, say, that performance of Sarah Bernhardt that they had seen or that performance by Nureyev and Fonteyn,or Joan Sutherland in 'Lucia..' etc. This performance, too, will in time become a legendary one. Surely? Those two young high school boys near the beginning of their theatre going lives will have a memory of a 'Holy Grail' moment in the theatre that will haunt their expectations every time they go to the theatre in the future and will drive them to return and return to it, in the possibility of a matching bath in greatness. Rare. Rare indeed. But worth chasing. 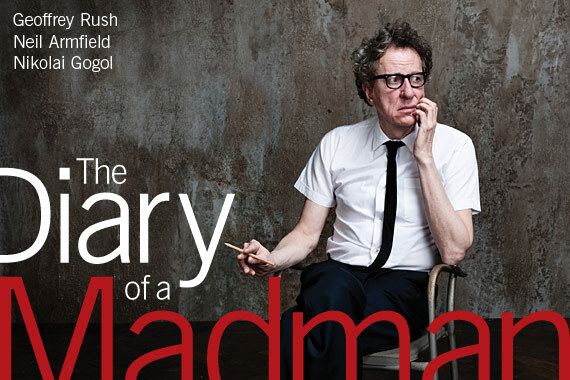 Those of us who have seen Geoffrey Rush in this season of DIARY …are very fortunate indeed. Watching this work in the theatre and going to the 'pictures' to see THE KING'S SPEECH with Geoffrey Rush again giving a flawlessly judged and executed performance, for a completely different performing medium, is to see an actor in TOP form. Surely the two pieces of work represent some pinnacle of achievement for this man. I jolly well think so. From the very first off-stage line and clattering noise down the proposed stairwell of an apartment in St Petersburg in early nineteenth century Russia, Mr Rush presents a man in a spiralling journey arc into madness. At first pathetically comic, moving through a vivid and intensely calibrated descent to the wretched, wrenching drama of Poprishchin madness, there is not a moment of uncared for expression either vocally or physically by Mr Rush that does not unobtrusively capture and seduce one to belief, empathy and emotional commitment for a fellow human being. The intelligence of the performance and the mastery of the actor's instrument is stupendous to behold. The greatest joy, of many, is the physical command. A moment to be relished, is the moment when as an audience, one is suddenly aware that one of the water drip pans on the floor has become an accidental shoe for this man. The greatness of this ridiculously funny image is that you neither see the set up or subsequently the slip out. It is expertly seamless in execution and invisibly sewn into the technical armoury of this great clown. Mr Rush trained early in his career with Jacques Lecoq and there has always being ample evidence of this mentorship / training in his expertise. It seems, to my eye, over the years, an essential and early entry point of creative energy in the work of this performer (a sideline is to quote Geoffrey Rush also honouring the influence of the great Australian Movement Teacher, Keith Bain, in the recently published book on that man's work and contribution to the Australian acting proffesion  ). 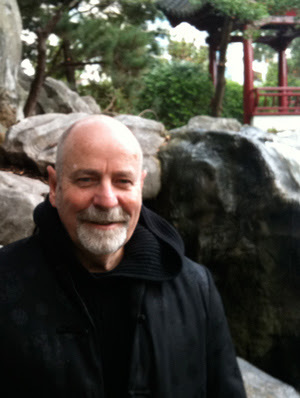 Mr Rush's body is a powerhouse tool of expression matched with his intelligent insights to character and vocal control. It is also hallmarked with an apparent sense of improvisational freshness that sometimes crashes pleasantly through the fourth wall of the space and acknowledges the audience as an accomplice to the evening's possibilities of fun and compassion. The collusion Mr Rush has had with his costume designer, Tess Schofield, is detailed and remarkable in defining the character and his journey. But the visual triumph of the image design, certainly has to be the wig stylist's work, Kylie Clarke. The intricacy of the detail red hair zones, alongside the fine wafts of the hairs as Poprishchin moves about the stage, pathetically add as telling signatures to the decline of the man (sacrilegiously, I should mention that often the late Ruth Cracknell, came to mind, in some of the imagery captured by Mr Rush). The Set design by Catherine Martin, of a low ceiling attic in garish red , green and yellows is exactly right, abetted to full effect by the lighting of Mark Shelton. This work is not a solo piece however and the contribution of Yael Stone, in its limited textual opportunities is matched to the intensity and detail of her partner, Mr Rush. The girlish love struck innocent, Tuovi, is delightfully moving; the doll ideal of Poprishchin's devotion, Sophia is delicately embodied and the truly dreadful horror of Tatiana in the mad house, is devastating in her wordless presence. But, further, the work is not a duet either, for the performance presence and subtle contribution of the two live musicians, Paul Cutlan and Erkki Veltheim are also vital in the comic underlining and capitalising of moments. The music score by Alan Johns intricate, sophisticated and engaging. To admire all this work is to compliment Neil Armfield, the Director, who has accomplished the gathering and marrying of all these great elements with such subtlety, that it is invisible in its crafting - surely a compliment that some of our director auteurs could consider in their pursuit of theatre presentation - the seeming absence of the directors hand/siganture IS Mr Armfields siganture, in his theatre and his opera work. He lets the work and the workers speak to the audience untrammelled by the intellectual convolutions of theatre art theory. Nothing boring or extraneous here. The text principally by David Holman, but influenced by Mr Armfield and Rush is a fairly straight forward rendering of the short story by Nickolai Gogol. Written in 1836, at the same time as his famous play, THE GOVERNMENT INSPECTOR, there is an uncanny prescience in the mapping of Porishchin's journey into madness, when one reads that Gogol himself was driven by obsession into madness, religious mania and death within ten years. The life in this play of this obsessive and deluded clerk reminds one of the works of Kafka (THE TRIAL, METAMORPHOSIS) and of the late Sarah Kane. The tragedy of the possible psychic paths of humanity keeps on and on, whatever scientific discoveries occur. The constant facts of the fragility of humanity as animal is humbling to experience and when in the hands of inspired artists strangely life affirming. Those of you who did not get to see this work missed a great event in Sydney theatre experiences. This production moves on to the Brooklyn Academy of Music soon and I recommend not to be missed. The ticket price here in Sydney $56.00. The worth priceless. At the performance of UNCLE VANYA that I attended, Mr Rush did too, sitting a few rows before me. How I longed as that evening wore on, with all due respect to Mr Roxburgh, the winner of the Sydney Theatre's Critics Award for Best performance by an actor in 2010 in that role, that Mr Rush had also been a member of that cast. The vagaries and dreams of the theatre makers and audience. Still to have both of these casts on Sydney stages at the same time is a testament to the toiling of the arts and artists in this tiny, relatively, country of theatre goers. A festival of Australian artists. KEITH BAIN ON MOVEMENT. Edited by Michael Campbell. Currency House, 2010.